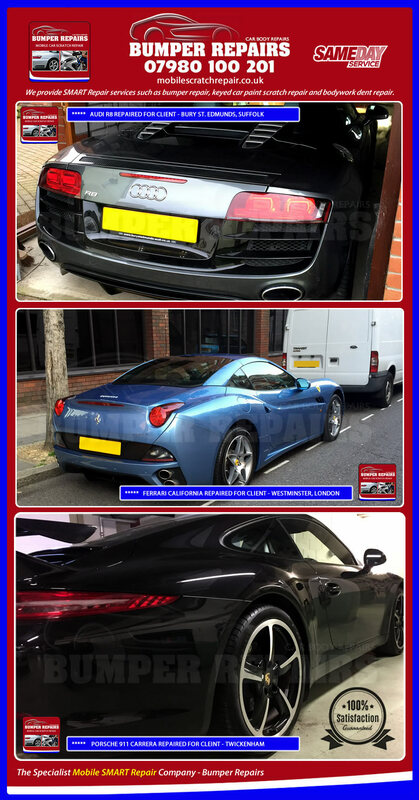 We are proud to specialise in mobile car scratch repair to take plastic bumper scrapes, car paint scuffs, bodywork dents and dings, malicious key scratches and stone chips away in London, Surrey, Kent, Essex, Hertfordshire and Sussex. Cosmetic vehicle damage not only looks unsightly, but can also reduce vehicle resale value. The traditional way of repairing vehicle bodywork scratches involved a lengthy process as the vehicle progressed through the bodyshop, however our our multi-skilled vehicle technicians can complete a range of paintwork scratch repairs in a fraction of the time. Our mobile car scratch repair services are suitable for repairing panel paintwork and alloy wheel damage, to a wide range of vehicle’s including Alfa Romeo, Aston Martin, Audi, Axiam, Bentley, BMW, Cheverolet, Citroen, Daimler, Ferrari, Fiat, Ford, Honda, Jaguar, Jeep, Kai, Lamborghini, Land Rover, Lexus, Lotus, Maserati, Mazda, Mercedes Benz, MG, Mini Cooper, Mitsubishi, Nissan, Peugeot, Porsche, Renault, Rolls Royce, SAAB, SEAT, Skoda, Subaru, Suzuki, Toyota, Vauxhall, Volkswagen and Volvo. Many of our customers are surprised when they obtain a quotation from us, which is cheaper than their insurance excess meaning they do not have to claim on their insurance policy and lose any no claim discounts or bonuses.